Marion Lewis established the Marion Park Lewis Foundation for the Arts in 1992 to award scholarships for Northern Shenandoah Valley students of music, theater, dance, painting, sculpture and creative writing and to provide grants to area arts organizations. Since that time more than 2.5 million dollars in grants have been awarded. Mrs. Lewis was a life-long lover of the arts who earned a bachelor’s degree from the University of California at Berkeley in 1933. She did graduate work in drama and dance. Mrs. Lewis came to the Winchester area in 1941 and, with her husband, founded the radio stations WINC-AM and FM. After Mr. Lewis died in 1957, she directed operations of their seven radio stations in three states and expanded the Mid-Atlantic Network, Inc., to include cable television. She retired in 1971, passing the business on to her three sons. When she arrived in Winchester she was told that people who wanted to “take in” the arts had to go to Washington, D. C. But she didn’t settle for that. Her goal was to bring the arts here and to develop arts with the people here. In 1942, she led the effort to reactivate the Winchester Little Theatre after it closed at the beginning of the war, twice serving as president. In addition, she performed leading roles in 13 productions, directed 27 plays and worked on nearly every production from 1950 until 1980. In 1974, she was a major force in the fund-raising campaign that enabled the group to purchase the freight station that continues to serve as the home to the Winchester Little Theatre. In 1945, she and Eugenia Evans were the sole attraction for the first Hospital Auxiliary fund-raising project entitled “The Talents of Our Town.” Marion Lewis danced to the piano accompaniment of Eugenia Evans in an evening program that increased the coffers of the Auxiliary by $2,000. Her work in the arts has not been limited to adults. She directed the community’s first large-scale children’s play at the Winchester Little Theatre as well as several others that followed. She conducted the first drama classes for children in the area at the Handley Library and served as a resource person in the arts for dance and drama for the Winchester Public Schools. Prior to the establishment of a theatre program at James Wood, she directed several of the senior plays for that school. 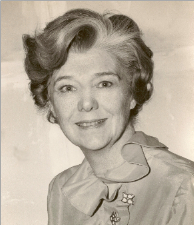 She was instrumental in establishing and promoting numerous arts organizations in the Shenandoah Valley and was the first person from the Winchester area to be appointed to the Virginia Commission of Arts and Humanities, on which she served from 1971-1979. During that time she instigated the formation of the Shenandoah Arts Council and was instrumental in getting funds from Frederick County that were matched by the Virginia Commission for the Arts for it. She was instrumental in obtaining funding and recognition for other arts organizations, such as Wayside Foundation for the Arts, the Bluemont Concert Series, the Handley Library, the Shenandoah Music Festival and Shenandoah College and Conservatory, now Shenandoah University. In 1992, Mrs. Lewis established the Marion Park Lewis Foundation for the Arts to nurture the development of local artists. That first year, $5,000 was distributed. In 2018, $160,000 was available to artists and to non-profit organizations dedicated to arts education. The Foundation carries on Mrs. Lewis’ commitment to the arts with a Board of Directors made up of her family members. An independent Review Panel with representatives from the various arts disciplines conducts the work of the Foundation by reviewing applications and making the grant decisions. Information for this biography was obtained from the Lewis family, the Winchester Star, the Northern Virginia Daily and Some Worthy Women, written by Michael Foreman and published by the Winchester-Frederick County Historical Society. The photograph was taken by the late Allan Richardson. Copyright © 2019 Marion Park Lewis Foundation. Website by transeffect llc of Winchester, VA.